During the Tamil month of Panguni, the traditional brahmotsavam takes place when the entire neighborhood comes alive with a mela like atmosphere. 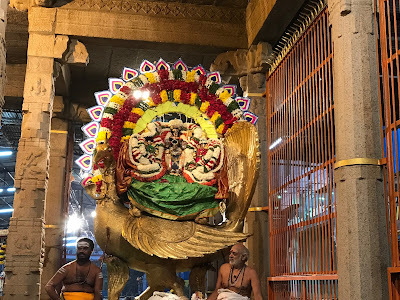 Since this month corresponds to the mid-March to mid-April duration, the Kapaleeshwarar temple celebrates the nine day-long as Panguni Peruvizha. 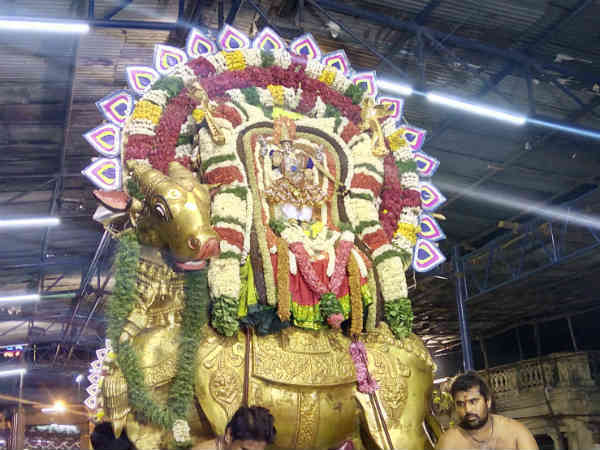 The festival starts with Dwajarohanam (flag hoisting), includes the Chariot Festival (therotsavam), Arupathimoovar festival and concludes with the Tirukkalyanam. In Brahmotsavam, the idols of Kapaleeshwarar and Karpagambal are decorated with clothes and jewels, are mounted on a vahana, and then taken around the temple and its water tank in a pradakshinam. 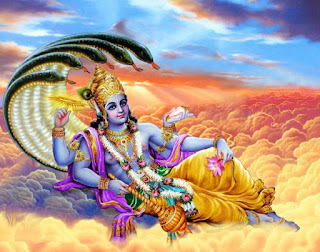 This is repeated with different vahanas over the next nine days. 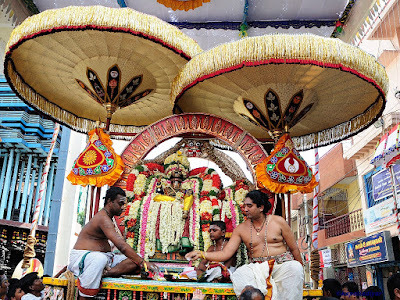 The more important of the individual pradakshinams are the Athigara Nandhi on the third day, the Rishaba Vahanam on the midnight of the fifth day, the chariot festival(ther) on the seventh morning, and the Arupathimoovar festival on the eighth day. 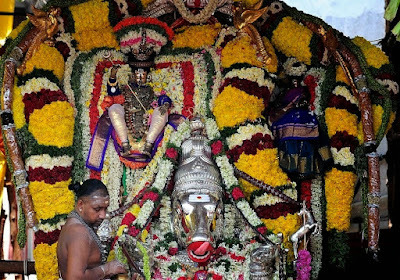 The Arupathimoovar festival is the most important procession. It is named after the sixty-three Nayanmars who have attained salvation by their love & devotion to the all-compassionate Lord Shiva. All sixty-three Nayanmar idols follow the Kapaleeshwarar idol on this procession. 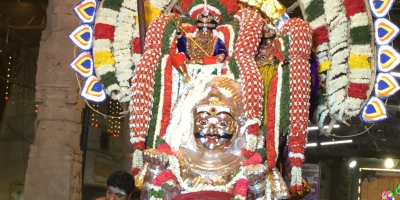 During the chariot festival, Kapaleeshwarar is depicted holding a bow while seated on a throne, with his wife Karpagambal alongside. Brahma is depicted riding the ther. 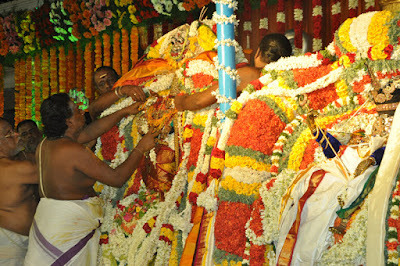 The chariot is decorated with flowers and statues, and there are huge gatherings of devotees to pull the Chariot(ther). 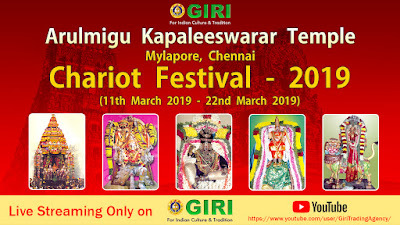 Arulmigu Kapaleeswarar Temple, Mylapore Chariot Festival – 2019 Watch Live from 11 March on Giri Trading Agency YouTube Channel. 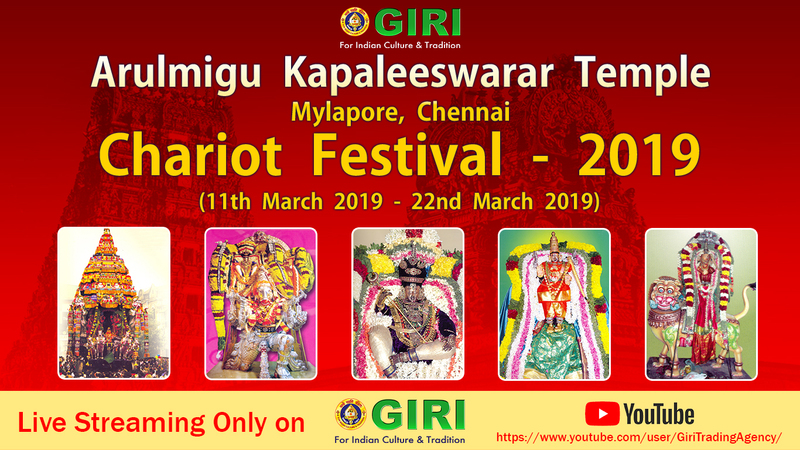 Mylapore Sri Kapaleeshwarar Temple Panguni Festival will be held from 10th March to 22nd March, 2019. Kolavizhi Amman is traditionally considered to be the Guardian Diety of Mylapore, hence any function or festivity begins by honoring her. A Puja for Kolavizhi amman is performed on behalf of kapaleeswarar temple. Her sannidhi is near Mudaga-kanni amman temple in mylapore. This marks the official commencement of the festival. the flag marked with nandi is hoisted upon the dwajasthamba (The Gold Plated flag staff facing the shrine of kapaleeswara) inside the temple premises. 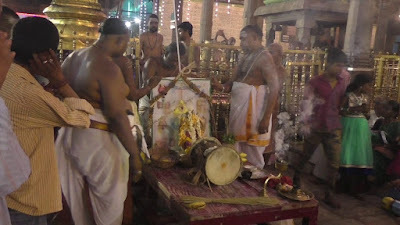 The evening is marked with the procession of karpagambal worshipping kapaleeswara in the form of peacock under the punnai tree in a palinquinn. Kapaleeswara with Surya as a backdrop flanked by Karpagambal comes out in procession in a decorated pavilion. Karpagambal rides on a colorful parrot and Murugan (also known as Singara Velan) on a swan. Kapaleeswara with Chandra as a backdrop flanked by Karpagambal comes out in procession in a decorated pavilion. Lord kapaleeswara appears in a grand spectacle held by magnificent large adhikara nandi. Karpagambal rides on Gandharvi vahan (A lady with a veena) while Murugan rides on a Gandharva Vahan. When the procession reaches the South Mada Street, the ritual of Goddess feeding the milk of Gnosis to The Tamil Saint Thirugnana Sambandar is enacted. Bhootan & Bhutaki are Demon & Demoness. This Vahan reinforces the need for taming the Demonic insticnts of the Human Mind. The morning is made a Divine spectacle riding on Prushamruga (Spinx) while the Devi is riding a Simha (Lion) Chariot while Murugan is on Yazhi (Dragon Look-alike). The evening Kapaleeswara can be seen charmingly under the perfectly hooded snake acting as a canopy. The Devi is on Kamadhenu, the wish yielding cow with a human face, justifying her name, the one who yields everything that is wished for. 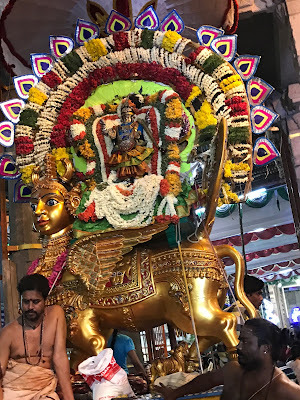 Murugan is shown riding a Ram. 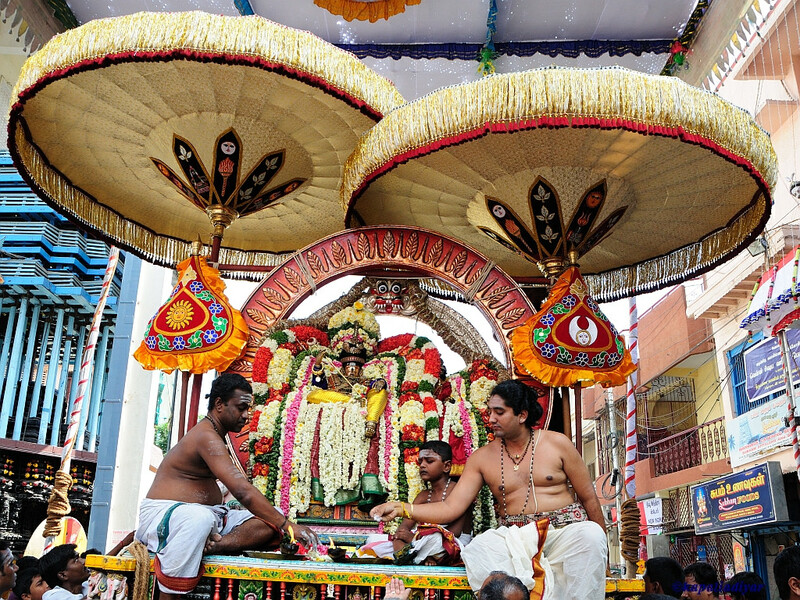 All the Deities come out in procession in Vimanas (Decorated Silver Canopies) and participate in a specially endowed puja in Vaniga vaishya mandapam on East mada street. 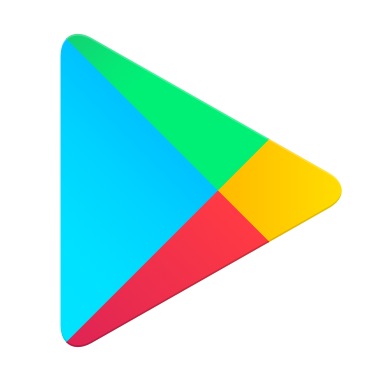 The location is given below. The fabulous Silver Rishaba Vahanam (Silver Bull) with Kapaleeswarar on a Gigantic Silver Bull and The Devi on a Golden Bull and Murugan on Golden Peacock make a magnificent appearance as they march out of the main gopuram. A special rendering of Nagaswaram playing Mallari is the hallmark of this event. Even though this procession begins so late in the late/early in the morning, it attracts thousands of bhaktas, devotees, and tourists from all over the world. It is marked with all the deities in procession seated in a palanquin in the morning. 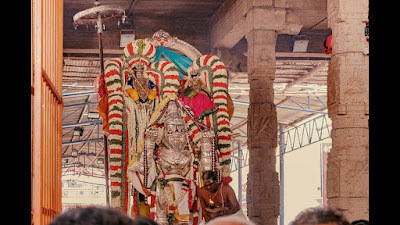 The beauty of this procession is that all the 5 Processional Deities (Ainthirumeni) parade on colorful & charming elephant mounts of different sizes. 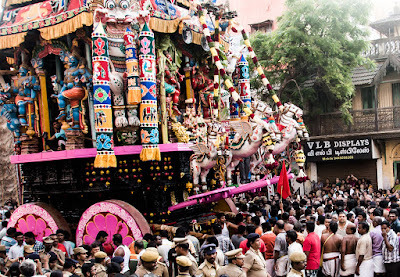 7th Day is one of the Most important ones where the exuberant devotees draw the temple chariot (Ther). around the 4 processional streets. This procession is a ritual enactment of Shiva's destruction of the Tripura wherein the entire cosmos and all the celestials served as His Chariot and its attendants. To this day, Bhrama can be seen pulling the reigns of the horses. It is considered especially auspicious to view the (Ther) in motion, hence, Hundreds of Thousands throng to pull the Chariot. The Spirit of unity and service can be observed all around neighborhood. Food and refreshments are served by residents all around. The Day is declared as a local holiday. In the evening when the Ther comes back to its base, Kapaleeswara is taken back to the temple in a grand procession with sounds of music filling the air. Arupathu Moovar Thiruvizha is the feast of 63 Shaivite saints. 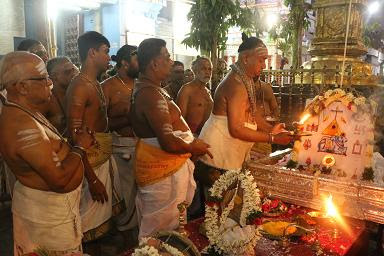 This event is considered the landmark of Mylapore since it is only here that one can find the 63 saints in processional form. (In other Shiva Temples) the Nyanmars (Saints) are located inside the temple as immovable granite figures. 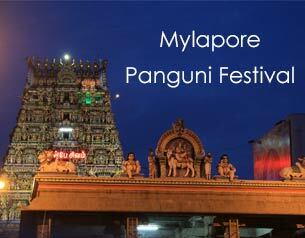 This event attracts lakhs of people who congregate on the 4 streets of mylapore. It is not just the people but innumerable deities from temples around the city congregate in their decorated palanquins to participate in this procession. All the Nyanmar icons are carried around the temple first and then go around the utsava murti of kapaleeswara who is seated majestically in a silver vimanam (silver canopy). It is a moving sight to see the 63 saints, hands folded in bhakti, rallying around their Lord. Late in the evening, after all the deities and nayanmars have returned to the temple, Lord Chandrasekhara rides on a horse around the 4 Mada streets to keep a count on the happenings. Worship is offered for the 5 Processional deities. 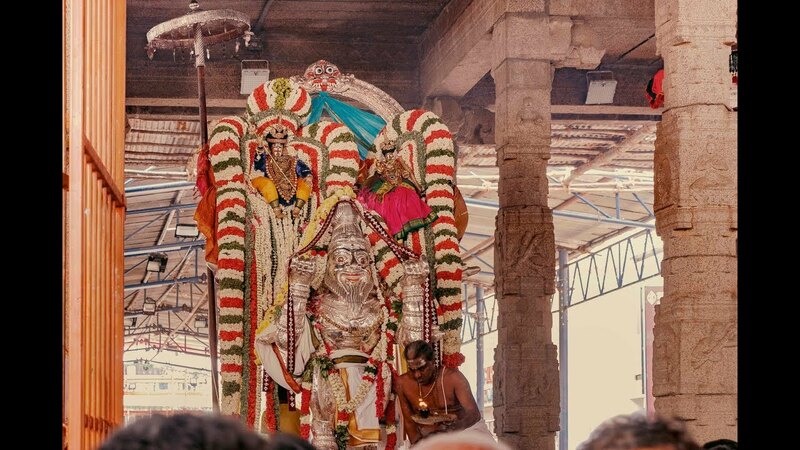 The Five Processional Deities are Chandikeswarar (Commander in Chief of Siva Ganas), Ganesha (Remover of Obstacles), Kapaleeswarar (Presiding Lord), Karpagambal (Divine Mother) & Murugan (Commander in Chief Of Celestial Army). 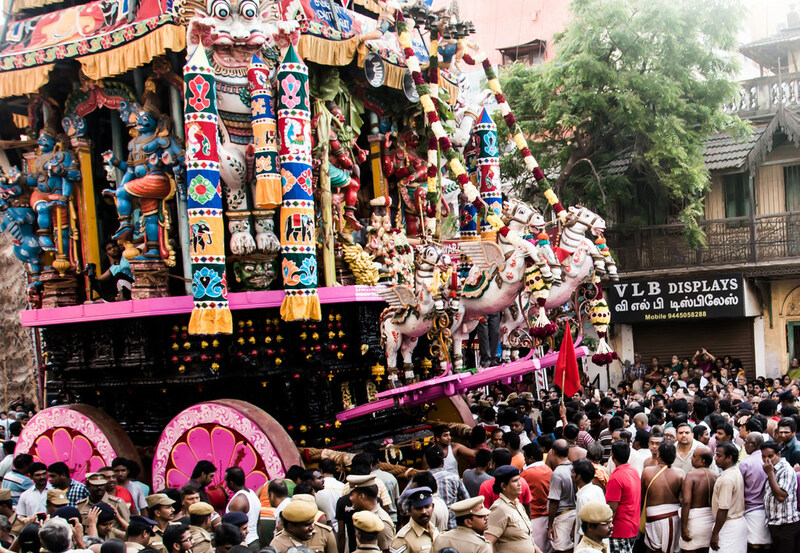 This is a unique procession wherein Kapaleeswarar can be seen walking around the streets in the form of a mendicant holding a begging bowl. One is reminded of the fact that Humility is the highest virtue and this espoused with the Lord himself who visits every house on the Mada street in this ecno-graphical form. This is the procession of Lord Nataraja around the 4 mada streets. With the full moon casting its silvery rays on the temple, people wait to visualize the wedding of the Divine Couple. 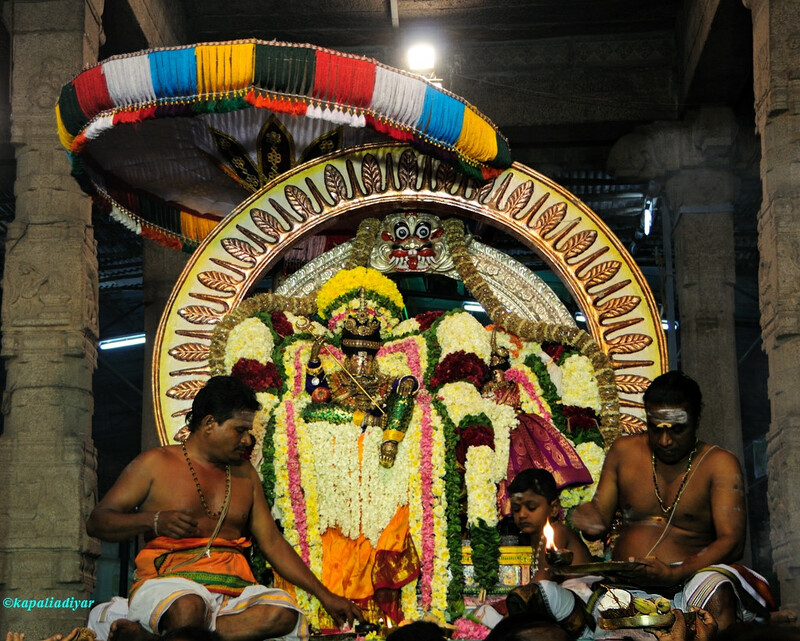 The Goddess as peacock worships Lord Punnaivannanathar located in the northern precincts of the temple. Kapaleeswara appears to her in the form of a decorated icon and soon the Goddess regains her original form. The Lord & the Goddess, now dressed as the bride and the groom proceed to the wedding arena with the priest officiating a long drawn out ritualistic wedding being performed. Vedic chants and Nagaswaram Music fills the air. After the wedding, the Lord and the Devi come in a grand procession riding on an enormous image of Ravana carrying the Mount Kailash. A special feature of this procession is instead of the robust nagaswaram, a mellifluous flute is played. At the end of the procession, when the deities return to the temple, they preside over the lowering of the flag to denote the ceremonial end of the 10-day festival. Lord Kapaleeswara and Karpagambal give darshan to the devotees in a relaxed manner within the precincts of the temple. Beginning of the cultural festivities. Hello Maám, We had done live streaming of specific events during the festival..